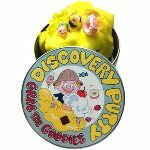 Arctic Squeeze Fidget Ball Set gives 3 different feels for fidgeting in the artic snow. Perfectly sized for little hands these balls are the perfect fidget. Our durable exterior holds the balls with the smallest amount of gel, which leads to the wonderful movement and texture experience. As a bonus kids use even more intrinsic muscles to find the three polar friends found in each of the balls. Mama Penguin leaves a hint that Baby Penguin is nearby. Finding the clear ice cube can be a real challenge! Each interior has different sized fill that promotes language opportunities. Kids just love them. Adults appreciate their durability. Each ball has different sized fill and measures 4-1/4 inches in diameter.Set of three. Filled with balls and lubricated with a non-toxic gel. Excellent tool for special needs therapy. Challenge students to find the clear ice cube inside. Kids LOVE these fun squishy polar snow fidget balls! 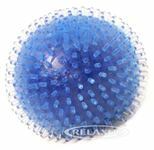 Size: Each ball has different sized fill and measures 4-1/4" in diameter.